This Yanin Vismistananda movie page contains 4 records. Kham's (Tony Jaa) elephant is stolen as he refuses to sell it. His elephant is like a brother for him as they have been together since his youth. Kham follows the robbers up to Bangkok. He finds the leader but he has already been killed through a few severe hard punches. His two daughters (including Yanin Vismistananda), believing Kham killed their father, chase him. Kham meets again the Australian policeman (Mum Jokmok) but he lets him go knowing Kham is too nice to kill somebody. The ruffian having stolen the elephant is also an organiser of illegal fights. Through Bangkok, Kham is facing the ruffians through many thrilling fightings (against bikers on rooftop, in a factory, on metro railroad tracks, in a room on fire...). The ruffian leader is in fact working with some generals coming from a small kingdom. Following a rebellion in this Kingdom, a peace truce shall be signed in Phuket, Thailand. An elephant shall be given as a peace symbol. It is in fact Kham's elephant whose tusks have been filled with explosives. Many CGI are used in Tom Yam Koong 2 movie. A huge budget was spent but the box office sales were disappointing. Only 56M baht were reaped in Thailand. Even Tony Jaa didn't join the movie promotion in Thailand as he was already involved in “Fast and Furious” sequel 7. The movie was released in many other countries such as Hong Kong. Panna Rittikrai was also involved. 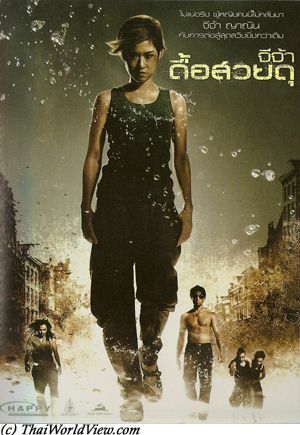 Prachya Pinkaew was the director. It is a 1h44mn movie with non stop action. It took two years to be released. A Korean couple (อาจารย์ Moon) was participating to Taekwondo events during Olympic games. The wife won her final but the husband failed. Twenty years have passed and they have now three kids. Two of them are now two grown up teenagers, i.e. Tayang and Tae Mi. The father Moon is having a Taekwondo school in Thailand and still trains them to excel in Taekwondo. A mysterious business man from Korea wishes to steal an old Thai blade (สมบัติของชาติ). Tayang sees the robbers and intervenes. The parents are also involved with the robbers’ driver. The blade is taken back but the robbers succeed to flee. Ruffians are looking for revenge and storm the Korean couple’s house. Tayang wishes to be a dancer and not a Taekwondo champion as requested by his father. The father failed to get a gold medal 20 years ago and wishes his son to get one. Uncle Bom (Mum Jokmok) brings the children outside Bangkok as it starts to be dangerous for them. They meet Wawa (Yanin Vismistananda), who is a Thai boxing champion (มวยไทย). Korean Taekwondo is meeting Thai boxing! Tayang flees at nighttime to join the last audition to become a dancer (dream project). While he is away, the campement is attacked. He helps on time but cannot prevent his youngest brother to be kidnapped. To get back his son, the father needs to exchange him with the precious blade to be stolen during an exhibition. Despite getting the blade, the head of the ruffians refuses to honor his promise. Final fights happen in Bangkok zoo. As often in modern Thai martial arts movies, fightings involve elephants. The movie director is Prachya Pinkaew, who directed Ong Bak. Panna Rittikrai is used again as action supervisor. The Kick (วอนโดนเตะ) was released in year 2011.